This week we have our biggest New Product Post ever! Check out the new Actobotics product line. This week is a very special one for new products. Not only do we have more new products than ever before, but we also have a new video series as well. This week we are happy to introduce the Actobotics line of robotic components. We have a record-breaking 438 new products this week! Check out the video below. SparkFun has been carrying some robotic components since the early days, but they've never been a substantial portion of our catalog. With the increasing demand for robotics for various competitions, and better availability of controllers, sensors and processors, we felt it was a good idea to expand our selection of components to complement our existing product selection. To introduce this new venture, we thought it would be good to start a short video series, Robotics 101, to go over the basics of what you might need to know to build your own robot. We will be covering topics like motor choice, angular versus linear motion, servo modification, feedback systems, and more. The first video for this week is just a brief introduction to not only Actobotics, but the video series itself. There will be a total of nine videos, with a new one coming out every week. Since this IS a New Product Post, let's talk products! 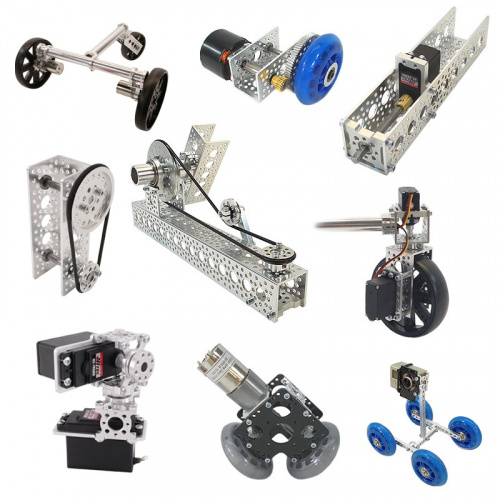 We ultimately chose Actobotics because of their vast product selection, quality, and compatibility. As you can see from browsing the Robotics Category, there should be just about every size of gear, tube, or shaft that you need. Additionally, instead of plastic, they opt for aluminum or stainless steel, and use ball bearings instead of relying on plastic bushings. Lastly, we really like the fact that nearly all of the products work seamlessly with one another. 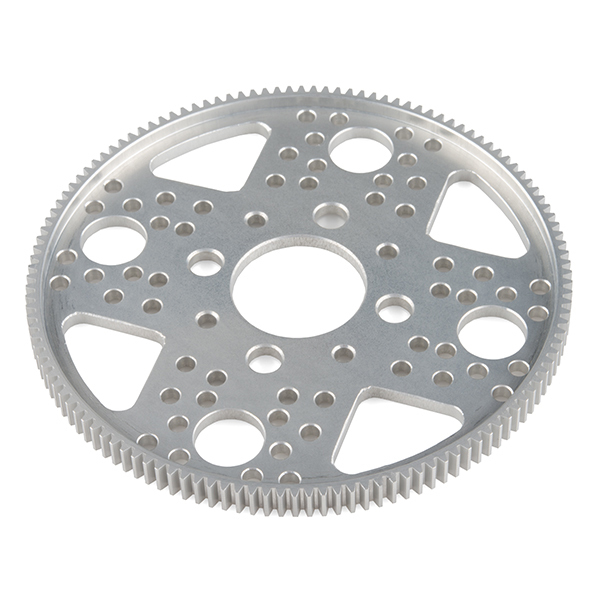 Actobotics products use either a 0.77" or 1.5" hole pattern, allowing you to easily connect a gear to your servo, and then connect your servo to one of the channels or beams. 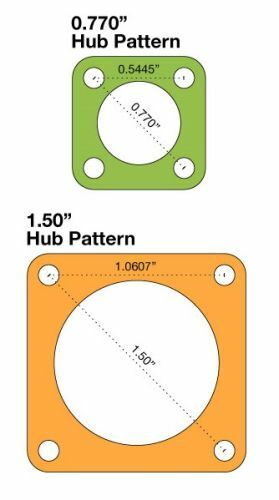 We have added images on each of the product pages (where applicable) to show which hub pattern each part is compatible with. If two parts both use the 0.77" hub pattern, they will work together – it's that simple! For all of the parts, you only need 6-32 screws and a screw driver or hex wrench for assembly. There's no need to drill or tap your own holes or even use washer or nuts. This makes putting together relatively complex and rigid structures quick and painless. I'm not going to talk about all the products individually, but I do want to give a brief overview of the categories and products so you have a better idea of how to find what you need. Let's start with the structural category, which is the backbone of the Actobotics product line. 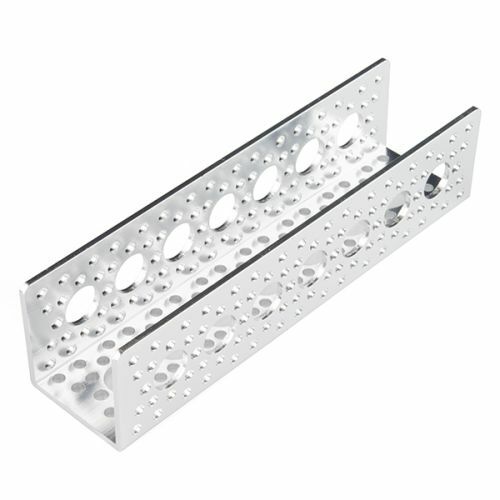 The Actobotics aluminum channels come in sizes as small as 1.5" all the way up to 24". They all utilize the 0.77" and 1.5" hole pattern and even have 0.5" holes that are prefect for a 0.5" flanged ball bearing. These channels are strong and can easily serve as the skeleton for your creation. They have numerous attachment points and will work with nearly all of the other products. If you need something a bit smaller, you can also check out the the aluminum beams, which can also be found in the structural category. Screw plates are an easy way to connect multiple channels together. There are also numerous hubs and clamps which allow you to connect just about anything. We also now have a wide variety of both shafts (up to 1/2" thick) and tubing (up to 1" thick) in both aluminum and stainless steel. These can work in conjunction with hubs and clamps to either form rigid structure, or drive-shafts for wheels, servos, levers, etc. Check out the couplers/collars category for everything you need to connect the output shaft of a motor to your drive-shaft. Also, while you're there, check the bearing blocks category for all our ball-bearing mounting options. Use shaft spacers as a spacer between your bearing and rotating component, such as a wheel. Need to get things moving? 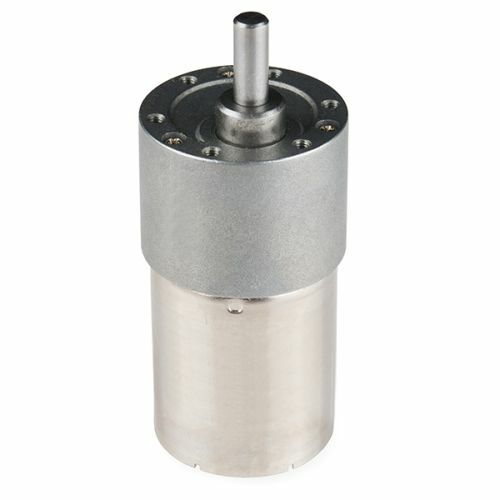 Check out our new selection of DC gearmotors. We have a new selection of micro gearmotors with a range of 90 RPM up to 4900 RPM. They also have a special enclosure which allows them to bolt directly to the 0.77" hole pattern. Next up are the standard gearmotors. These are a cost-effective solution if you need a bit more power than a micro gearmotor. They range from 0.5 RPM to 303 RPM. And lastly, we have the precision gearmotors. These are great for more demanding applications where you need more power. They range from 6 RPM to 90 RPM. The motor mounts category different plates for connecting your motor to your structure. You have a motor, what about getting power to your wheels? We've got you covered. We have gears, pulleys/belts, and even sprockets/chains. And of course they all work with the same hub mounts, so they're easy to attach to shafts and tubing. All the gears have the same tooth pitch, and the sprockets use the same chain, so you don't have to worry about compatibility. If you want to use servos for control, we have a lot of options here too. If you want a simple solution for adding either a shaft or hub to your existing standard or 1/4-scale Hitec servo, check out the ServoBlocks. These come as kits (you provide the servo) and give you multiple mounting options as well as a sturdy ball-bearing-supported output shaft (either smooth or with a hub). If you just need to mount your servo, check out the various servo plates. Of, if you want to use your servo with gears, we have numerous pinion gears that should mate with just about any common servo. 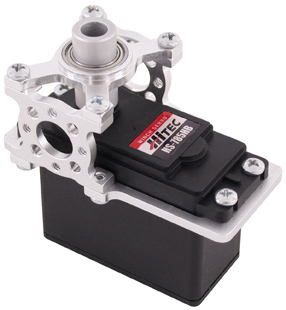 You might want to look at the servo mount category for all your servo mounting needs. Our new selection of wheels should have something for just about anyone. From the big 6" heavy duty wheel shown above, 4.9" skate wheels, to the various sizes and colors of precision disc wheels, there's a lot to choose from. A clamping hub is the easiest way to connect your wheel to a drive-shaft. They come in various sizes for different shaft diameters. Need linear motion? We have a few options for connecting plastic sliders to the aluminum channels to make simple linear sliders. 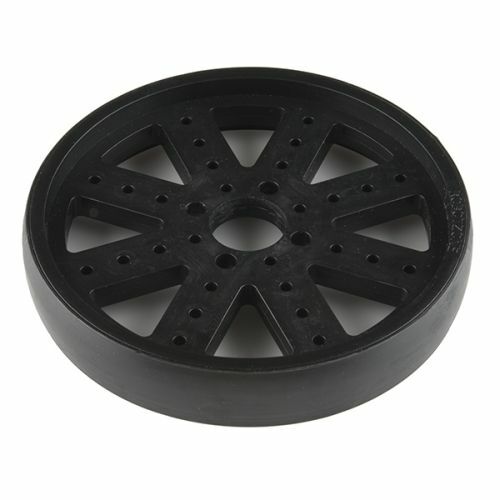 You can also look at the Dolly Wheel Plates which allow you to use skate wheels and 1" tubing to create your own motorized (or un-motorized) sliding dolly. The idler plate just glides along a rail, while the drive plate allows you to use a motor for precise speed control. What good would all of this be without the proper fasteners? 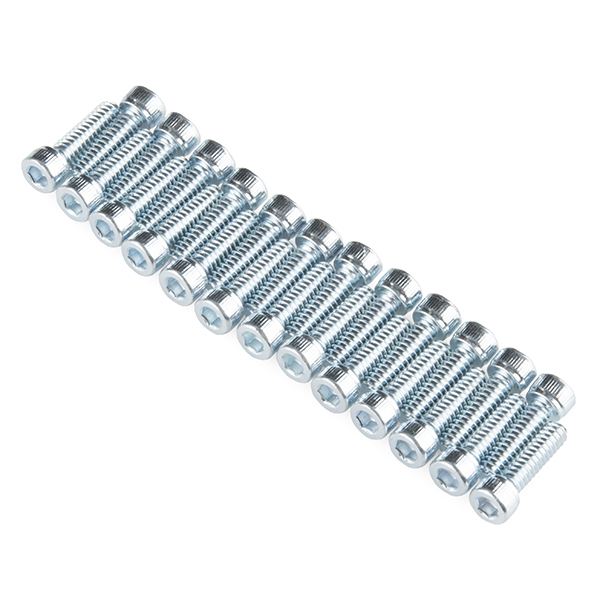 All Acotobotics products use standard 6-32 screws, so we have screws in 25 packs in various lengths. Also, be sure to pick up a ball-end hex wrench, it will make putting everything together easier. 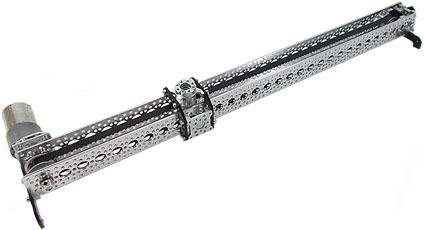 In addition, we also have several new 6-32 threaded aluminum standoffs as well. Wow, that was a lot! That's all we have for this week. Next week we have some really great stuff so be sure to check back then for even more new products. Thanks for reading, watching, and we'll see you again next week. Also, next week will be the second Robotics 101 video, Angular Motion. See you then! Prepare for Episode 2 of "SparkFun Live"
Please put together an Actobotics Inventor's Kit. Enough stuff to build like a base robot plus a few customizations. It's hard to even know where to start with all these parts, but I'm certainly excited to try it out! we will be doing something like this in the future, for now we just wanted to get them released. While we are waiting for SRIK, (curriculum will take a while to write & vet) how about a public wish list of robo parts? Are we any closer to having this available as a kit? technically no, but looking into it seriously now. Not terribly well, but I will ping it again, thanks for the reminder. SparkFun does have shareable wishlists, so I wouldn't be a bit surprised if someone put something like this together. I never thought that SparkFun would introduce more than 255 new products in one day. Today I opened my program which watches new product posts around the net, and all heck broke loose. Looks like some code needs to be updated (hint - newProductCount should be larger than a byte). That whiteboard art is marvelous. Please add some worm gears to the collection. Worm gears are great when you want to move something then have it stay in place without exerting any pressure on the motor. EG. a heavy pan/tilt mechanism. Motor turns worm gear which engages standard round gear. The round gear tilts the platform to the desired angle. Even if gravity is trying to pull the platform back to level, power to the motor can be stopped, as the worm gear holds the round gear in place without transferring the gravitational force back to the motor. I don't think any another company gives me a happiness sensation when they get new products, what is your magic sparkfun? Our magic is that we are as excited about this stuff as you are! And thatÂ´s why working at sparkfun would be my second dream job (first place goes to working with The Mythbusters lol) . I think sparkfun is where Mythbusters keeps their "on deck" employees.. it has to be so.. I think you have created the "Big Boy/Girl" Erector Set, for those of us who are old enough to remember what an Erector Set was (still is?). Great Job! Now, THATÂ´S what i call a new product friday! I canÂ´t express how delighted i felt to finally see all this. ItÂ´s not so hard to see a company selling robotics breakout boards and goodies online, but i find it very hard to find easily matching (and reasonably priced) HARDWARE parts to build robots and other stuff. ThatÂ´s exactly the kind of wall i bump into very often including nowadays while trying to build my new rover. i live in an apartment, and donÂ´t have the space or money to buy a CNC machine, a router, a lathe, and all the stuff necessary to do what i have in mind, so i, like many, have to go out and dig on companies "garbage" trying to find suitable and matching hardware to hopefully be able to build what i want. ItÂ´s great to see that this might change a little. Great work! 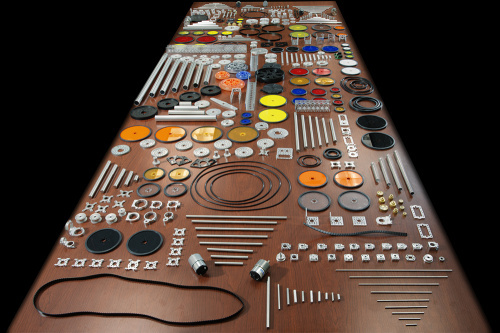 Heck you could make a CNC Machine (printer) with all this stuff. I've been waiting until everyone goes home so I can frolic in the new robotics stock without anyone hearing me shriek with glee; its pretty much the best place ever! You would save this until after all my Christmas money is already spent! The lightbulbs are a big project of their own. Check back next week for a proper demo video of them in action. Hello, best New Product Friday ever! Goodbye, bank account!!! People, prepare for much wrenching! Save a limb, get a Bondhus Balldriver in T handle or screw driver type handle at ACE or your favorite place. Sparkfun, I'm sure you will add something besides that L handle wrench. Think of the young lives you can save! However, I would love to see some groupings of these products. It is hard to just dive in to designing robots with this system without some sort of kit to start from or other type of grouping of components, so it's easier to see what you would need or want in a complete system. This changes everything!!! If you can imagine it, you can build it. Also, this is a long stretch, but I could definitely see would be kind of hard to make sure you get all the parts you need for a robot. Some sort of robot designer, or part layouts for an existing product would help. I agree. This selection is amazing, but I'm no good at planning. If I had a list of what to buy (or a kit), then this order would be placed...uber fast! We are working on getting some great wishlists together for this, as well as more demo projects. Keep an eye on the next few editions of the Intro to Robotics videos. This stuff looks nice, I'd love it if you could provide CAD files for the components (solidworks, Inventor, sketch up etc...). It would be particularly useful when making hybrid designs using custom hardware. almost all of the products DO have sketchup files actually. Amazing, I use sketchup a lot. That's just a part of getting old. Though I wonder if you didn't get 172pilot's pun. It took me a few glances to catch it. Or should I say "catsup" it. I prefer solidworks, but it's better than nothing. I would love to see Solidworks models for all the parts all in one easily downloaded zip file. That way I could build my robots in Solidworks and then order all the parts I need. At the very least having all the Sketchup models in one zip file would make it a lot easier to design robots. Are there any big kits of this stuff, or is it all spread out over ten million itty-bitty SKU numbers? I would prefer the former, as I have nephews in desperate need of such things. a kit might be in the future. the problem is that a kit can never cover everyone's needs, and with the sheer volume of parts, it's hard to put together a kit that's just not one of everything. I may try and put together some highlights in the future. but if you reallly read through the product post up top, I do give you some insight into how all the stuff work together. the hubs/brackets are how it all connects, the beams and channels act as the structure, and then all the other little bits serve their own purposes (whether they be bearing blocks, shaft couplers, etc). could have made kits similar to this: http://www.seeedstudio.com/depot/makeblock-m-49.html?ref=pinfo collection of usable parts for various task, something to getting started. and please, add some metric numbers..
How about a series of kits (Basic bot, motor / armature / bearing set, etc.) and a "group discount" plan where you buy many parts at a discount? Awesome! I hope you give us lots of examples of how to connect these bits together. I'm really not quite sure what I'd need to build something like a robot chassis, or a gear box, or an articulated arm. it takes awhile to wrap your head around really. We will try and do more in the future videos to show you how to connect things together. and with the new product videos, I will slip some examples in here and there as well. it's relatively intuitive though. This is one of the best New Product Fridays in a while. I wish there was a little bit larger version of Actobotics, though. We are actively trying to build a go-cart out of Actobotics hardware. This stuff is pretty tough. If you really need heavy duty, take a look a 80/20. I agree. I like building big stuff. Larger? Well, that would be cool! But I was thinking smaller, that 1.5 inch channel is huge for a lot of the robots that I build; 0.5 inch or even 0.25 inch channel would be more useful. Have you looked at MicroRAX? 10mm square 80/20, basically. microrax and maker beam will be going away from the catalog eventually in favor of actobotics. you might want to check out the actobotics beams, and they will be coming out with smaller channels eventually. Please keep the SI metric product ranges. actrobotics looks great but a system based on the concept of standardisation that uses the old imperial measurements is bizarre. Hello all. I have downloaded and renamed all the Actobotics Sketchup models. I have them all available in a repo at https://github.com/Deadbot1/Actobotics . Vex robotics has a nice programing interface that promotes the education of c script and is good for electronics / robotics. It's good we all try to avoid using the 'D' word in the discussion, remember a man named George OWNS trademark and copyright to the 'D' word and you can't use it without his permission. Motorola found out the hard way. Dear sparkfun: You owe me one pair of new pants. Thanks for this huge collection. I guess it's time for me to get started in Robotics. I would really like to see you add some 3/8 xl belts to your stock. Perhaps a few common smaller sizes, then bulk belting for linear positioning. The belting is available by the roll, you could sell it by the inch. As there are few easy places to buy small quantities of timing belts on line, I would expect you to do well. I know I would buy some. You all really screwed up ordering imperial components in stead of metric. You have just declared that you have no interest in selling to the rest of the world. Seriously though, my kids have Lego Mindstorms EV3 under the tree and now I am already working out how to plug that into this - great work guys!! Not metric?! Whyyyyyyyyy???? Great otherwise. Are the part models available in any other format than sketchup? Are there 2D part drawings available? i sooo was looking for any "meccano", "metallus", ... ..... kind-of-contemporary mechanic components builders set that runs small-pitched gears (that should even be compatible with "tamiya"'s "mini 4wd"'s product range as far as i understand the specs parameters). thanks, again, for being so considerate, helpful & innovative with the choice of your products, sparkfun! It'd really be useful if all the Actobotics parts' models were available as a single download. Right now, I have to download each part's model separately, meaning I have to figure out which parts I need before I start the design process. That's backwards from my flow -- I'd much rather have a library of models I can pick from in Sketchup. When my model's done, I can generate a parts list based on what works. In any case, glad you're carrying these. I've used a few bits of it in some recent projects and liked it overall. Do standard steppers fit on the various parts ? 2) Kudos for choosing aluminum and stainless! 3) Worms and racks, please. 4) I'm in the U.S. Regardless, I am foaming at the mouth, twitching with rage and disbelief, that anyone would continue to promulgate U.S./Imperial units of measure. If nothing else, the arbitrarily changing denominators on Imperial rules and drill bits, and the old numbered/lettered standards, are a spectacular waste of labor and source of accident/error. It's hard to find metric tooling and supplies in the U.S., and that might even be a niche opportunity that Sparkfun could dominate. I'm currently awaiting a dubious set of miniature metric taps and dies that are on a slow boat from China. I would have preferred to order from an outfit like Sparkfun for faster delivery and the implicit quality assurance that you provide. Sparkfun is pro-active and pro-education. Please get on board with the metric system! Metric has too many limitations. Base-12 is a better system. Sparkfun can show their forward thinking by providing base-12 products. The glyphs and nomenclature of the dozenal system are disputed and incomplete. Some of the proposals are impractical in real life (e.g. rotated-2, for dek, is orientationally ambiguous; backwards-3, for el, is problematic on transparent media). Otherwise, I'd agree with you! Duodecimal is very promising. Any idea if these components are mechanically compatible with the OpenBeam parts? Great new product post on first looks that was marred by using imperial units. Come on guys, the rest of the world is metric. I wouldn't buy these based on that. Is the light bulbs in the ceiling of the video working on morse code :)?! Don't mean to seem ungrateful, but, I don't see any propellers for those of us interested in building a heli drone. Any thoughts about adding those and lightweight frames suitable for helicopters? We've been looking into it, but so far haven't found any good options for us. HobbyKing is a good option or 3D Robotics are great places to check out. This stuff is too heavy for aircraft. Look on HobbyKing for multi-copter frames. This would've been great before I designed my robot. On the product pages of all the Actobotic products, does it say it's Actobotic product? yes and no. for the shafts, tubes, etc, it doesn't. but for the channels, hubs, gears, etc that all work directly with the hub pattern, it does mention actobotics, so you can use that to search. so, "actobotics gear" should bring up all gears from them. So is this is s Actobotic product even if the description doesn't mention it? yes, correct. the motors (both standard and precision) are 'generic' enough, as they can work with a lot of different projects, and aren't necessarily exclusive to the actobotics product line. however, the motor mounts for them are listed as actobotics, since they have the hole pattern. we don't have a system like that, even though we've talked about it. the problem with it is that it gets recursive and convoluted very quickly. So, what about sensors that work with 5V or 3.3V or 1.8V? or I2C, SPI, etc. The amount of time and effort it would take to classify all of our products would be monumental, not to mention the inevitable errors. We try to keep the majority of the information in the descriptions. Sure, it makes searching harder, but for the robotics stuff, it's really best to look by category. Once you learn what products the categories contain, it makes finding something much easier (I hope). Pinions are cool but they need a good selection of racks to go with it. pinions aren't just for racks... they are coming out with racks too, but they are meant to be paired with the other gears. This is an awesome collection of bits and parts. I predict we'll see many of them being used for the next AVC! Is this a home-grown design, or did you buy/license the parts from somebody else? "Acrobotic" on Google brings up a (presumably un-related) vendor. Is Acrobotics a trademark? Check your spelling there - the line is Actoboticsâ¢, and googling that brings up plenty of good stuff including videos on YouTube. Acrobotics would be a lot more specific - like robots that perform acrobatics or otherwise do stuff at great heights - which would be awesome. it's a product line by servo-city, or Robotzone LLC. I think it's a trademark. we are a distributor, that's all. yes, it is just mixed in, but at the same time, not everything is unique to actobotics, such as the shafts and such. we have an 'actobotics blurb' on products that are specific to them. Overwhelming. I hope you guys are going to have some examples - a kit or a bill of materials or wishlist that I can just add to my cart. Some tutorials also I hope. On the downside, how come you don't carry Makerbeam, Openbeam, or Microrax, something that would build 3-D printers and CNC? We do carry MicroRax! Check it out here. Completely agree, oh why produce such an excellent product such as this and then not provide it in a more universally accepted measurement system. Very US centric thinking. The majority of the world is SI Metric, not US Imperial. All our work is based on SI Metric standards, accepted and exported to Japan, Europe, UK, Africa AND US. Come on US, products with export potential and markets should be manufactured to Metric standards. Excellent addition to your catalog! Now I won't have to constantly flip back over to places like Servo City to grab mechanical items... Those ServoBlocks alone are an awesome addition to complement your servo selection, they are lifesavers when you have some potential lateral loading on your servos. Wow! Exciting product line! Can't wait to come up with a project that needs these partsâ¦. Awesome!!!!! This is what I've been waiting for. I'll be ordering soon. Way, way cool. Now I have to go back and re-think my next order. Do I get a discount on my birthday? Tubing by it's very definition is hollow; otherwise it's call "rod". It's a bit like saying an angular annulus. 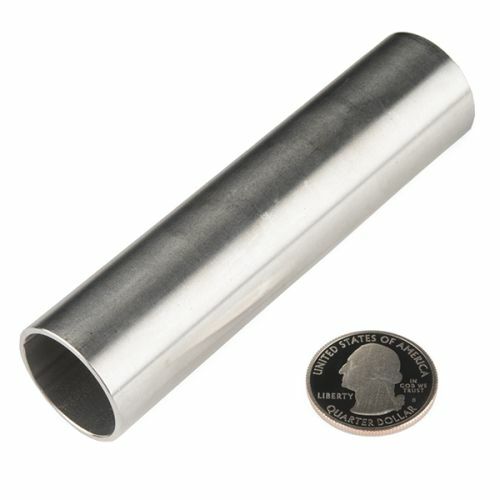 What do you call a tube which happens to be full of metal? What a great New Product Friday!